Celebrity obsession has escalated, driven by the wildly popular Celebrity Bounty empire, the magazine/website/syndicated TV show juggernaut that pays regular people; their citizen paparazzi, to help hunt down and get footage of the world's favorite famous people. In Celebrity Bounty, you'll see how an ordinary person and his family are turned into the world's biggest celebrity obsession literally overnight. Have a glimpse inside the shrinking world that celebrities have to wall themselves inside. This book will make you wonder about how our society gets its insatiable celebrity news and how far you'd be willing to go to help. All proceeds from this book will go to fund HOME Line, the non-profit that Michael Vraa works at with a dozen dedicated staff. "Celebrity Bounty is a finely woven narrative which captured my attention and involved me immediately. While persecuted by what would appear to be a windfall, the protagonist is never seen as a victim. He does become every man in the sense that the possibilities of his situation become relative to each of us. Vraa forces his reader to ride that razor's edge between fantasy and reality. The relevance to contemporary society draws his reader to identify and sympathize. This is a page turner, which conveys a scathing commentary on contemporary society." 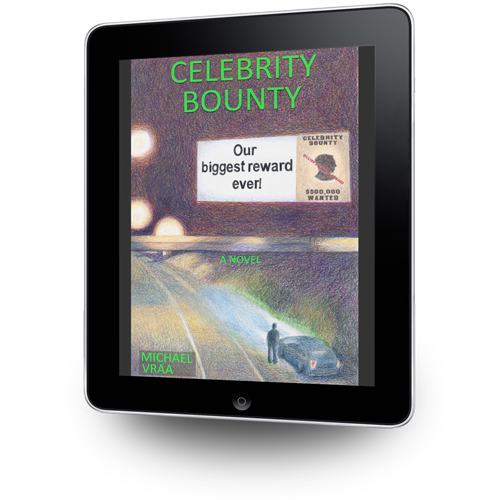 "Celebrity Bounty is one of those books that you just can’t put down. Michael Vraa’s writing style pulls you in, making you feel as if you know the Townsend’s as good friends, and empathizing with their challenges of a sudden financial windfall and an out-of-control media paparazzi. While I’m generally a non-fiction reader, this was an excellent piece of fiction, containing keen insights that make you think “what would I do if I were in that situation?” The plot and situation are certainly believable in this day and age of billion dollar lottery jackpots and an ever-increasingly connected world. Celebrity Bounty is an outstanding first-time effort for this or any author, and we should excitedly await Vraa’s sophomore effort."